Powerful, eclectic collection of songs from powerhouse singer Beth Wood. 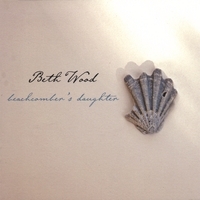 Beth Wood's latest offering, "Beachcomber's Daughter" was produced by Beth Wood and Patrick Mcguire. Beth gathered Dallas's finest studio musicians to form a core band that was just deadly! Milo Deering played just about everything with strings and contributed heavily to the arrangements and the overall fun of the project. BD is a lyric-driven, eclectic mix of styles, from downright rockin' (Travelin' John) to jazz standards (At Last) to folky (This Sanctuary) to piano ballad (Suitcases). In early 2008, Beth & Milo celebrated the release of BD onboard Cayamo, a songwriters cruise, alongside many of her musical heroes such as Lyle Lovett, Patty Griffin, Shawn Colvin, John Hiatt, and more! Beth grew up in Lubbock, TX, where she was classically trained in piano, violin, harp and voice. After spending two years studying voice and piano at Brevard College in North Carolina, Beth moved on to The University of Texas, where she picked up a degree in Literature and her first guitar. While teaching herself guitar, she joined a band and became part of the Austin music scene. After a few years of playing around Austin in her band, and then in a duo, Beth kissed her day-job goodbye and returned to the beautiful mountains of Western North Carolina to pursue music full-time. The natural beauty of her surroundings provided inspiration while the supportive community helped Beth to become a standout in the Asheville songwriters’ community. Now an established singer/songwriter, she resides in Arlington, Texas while continuously touring to support her seven independent releases. From the opening rocker \"Travelin\' John\" to the gospel-tinged \"Don\'t Give Me Diamonds\" to the jazzy \"At Last,\" Beth\'s vocals are spot-on! The arangements and producing are tight as well as the musicianship. Once agaqin, Beth\'s vocals are killin\' us - she is the real deal in songsmithing and voice. If you are a card player, this CD is a full house! Another great set of songs performed by Beth. How awesome it is we have such a great talent to inspire and entertain us as we travel through life. Always looking forward to more music from Beth and perhaps a return visit to OKC, OK.
Beth's music is like fine red wine, rich and vibrant with just a hint of fruitiness. This collection is another triumph for the barefoot singer songwriter. Now if we can only convince her to put "Homer" on a CD. We saw Beth in Little Rock, AR, and fell in love with her and her music. She has an amazing voice and song writing ability. Beachcomber's Daughter is awesome. She should be opening for Sheryl Crow! !